No doubt that juicing has many potential benefits for children as well as for adults. Juicing can start really anytime after 1 1/2 years old, but the key is to actually get kids to drink the juice regularly. Overall it’s important that the juices taste great. Read this quick article for a good introduction to the topic. …I have learnt there are definite dos and dont’s , when it comes to juicing with kids. I know first hand that simple is best, especially when juicing is a new experience. …be realistic of your child’s age and how long they have been drinking fresh juice. 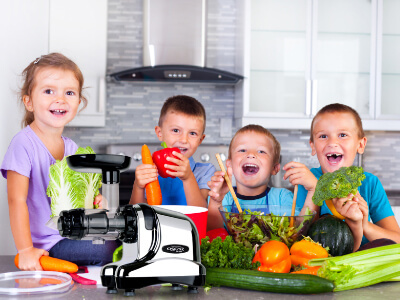 Starting small is an easy way to let them get accustomed with drinking a daily juice to build their juicing habit. Get the full article here….